I’m sure if your a football fan, or lover of any excuse to get together, indulge in libations and eat, then your starting to plan your Game Day eats! Before you invest your hard earned money in that $5.99 jar of canned cheese and $11.99 box of frozen rolled tacos, I challenge you to think outside the box and really WOW your guests with a Simple Swap take on a Mexican classic, enchiladas! 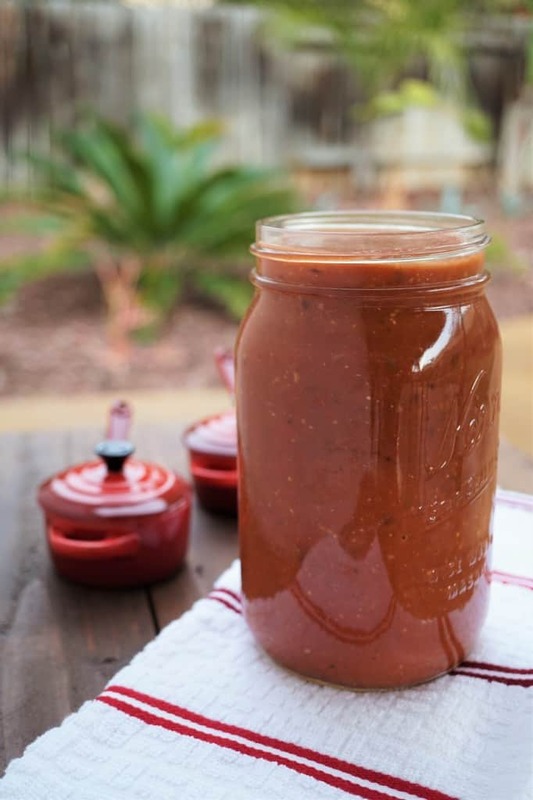 Today’s homemade enchilada sauce recipe kicks off a three part series to show you a healthified take on the traditional enchilada. I promise, it’s not as scary as it sounds! A few simple ingredients (which likely are in your pantry already), thrown into the Ninja, pulsed for a few minutes and viola… you have a Spicy Enchilada Sauce! Nix the canned simmer sauces and whip out your blender to make this Simple Swap original recipe! 1 tsp hot sauce I used Scotch Bonnet Pepper Sauce! Take out your Ninja and combine all ingredients into the large blender. Pulse for 1 minute and get ready to assemble your Mexican dish! You're average store bought Enchilada Sauce has 125 calories, 10 grams of total fat and over 500 mg of sodium... YIKES! Stay tuned for the second layer, Black Bean Dip, coming soon! How easy it is to make your own enchilada sauce! I better put my food processor to work (not that I don’t already haha). AND those are all the spices I always keep on hand..excellent ;). I’m looking forward to that dip!! You sound like you’re right up my ally having all those spices on hand! Enjoy!!! !